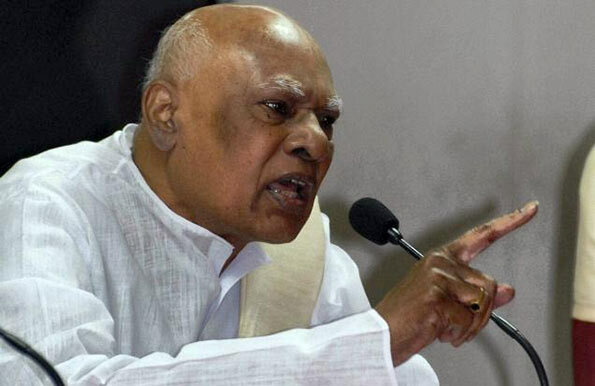 The Indian government should prevail upon the Sri Lankan government to take action against those who had committed crimes against Tamils in the last phase of the war, Tamil Nadu Governor K. Rosaiah has demanded in the state Assembly on Wednesday. The Hindu reported that the entire opposition parties had staged a walkout alleging the ruling AIADMK government had failed in all fronts and its failure to release water from Chembarambakkam Lake caused the flood in Chennai. DMK floor leader M.K. Stalin told reporters in Chennai that even though his party had demanded a judicial inquiry into the issue, the state government had not given any proper response so far. The Governor’s address also made no reference to the issue. Recalling the resolution adopted in the state Assembly asking the Indian government to take steps to adopt a resolution in the United Nations Human Rights Council (UNHRC) for an international inquiry into the war crimes and violations of the Geneva convention by the Sri Lankan government, he expressed the hope that the Indian government should persuade Sri Lanka to restore the Tamil families their lands. “It should ensure equal rights and an opportunity to live peacefully with dignity,” he said. The Governor had also condemned the regular attacks on Tamil fishermen and seizure of their boats and nets by the Sri Lankan Navy, saying the reluctance on the part of the Sri Lankan government in releasing fishing boats even after the release of fishermen had caused agony among the fisher folk in Tamil Nadu. “It is our duty to find a lasting and permanent solution to this issue by retrieving Katchatheevu and restoring traditional rights of our fishermen,” he said. Dear Mr Rosaiah remember the ‘last phase’ came after the first phase. Therefore, can you ask the Indian Government to do a investigation into atrocities (HR violation) done by the so called Indian Peace Keeping Force (IPKF). Also Sri Lanka need an apology from Indian government for training and arming LTTE. Mr. K. Rosaiah, Kindly note that ‘IF’ any war crimes happened, it happened inside Srilanka, not inside Tamil Nadu. You may look after the millions of issues that you have in Tamil Nadu itself. There are 67.86 million people in your state, half of them don’t have toilets. Please look after your toilet issues. You better go and make some toilets for the people in Tamil Nadu so they don’t have to urinate and poo on the side of the road. We always feel your stink in Sri Lanka even 20 miles away from you. All politicians who are eager to win publics heart by creating sentiments caused by Sri Lankan gov. TN legislation election is about , so these selfish buggers create wharever issues to grab more votes.this is the truth n more over TN people are not fool as like as earlier before over estimate these kinds rubbish politicians.Tamils are kind of sentiment people , even though very brave and selfish. When in 90’s , Muslims chased out from northern , leaving all assets and came in to NWP for shelter as inland rufugees. Still I remember one of my friend who graduated with me in jaffna university on those days said, suddenly at about 4.00am early moring LLTE terrorists announced to leave the place with empty hands as all you Muslims dogs earned those are belongs to this Elam.even the innocent Muslims hadnt get the set of spare cloths but only a milk bottle for babies n 200 rs in cash. This what they had when they were arrived to various places in NWP by trucks tractors’ n most of them were by walk by crossing and spending more nights in the middle of furious animals living Willpattu forest , even in the way some of them were died with out any medical attention, babies and infants aslo include who were came from Mannar. But now it is 2016 most of the Hindus who are mingling with our muslim community in muslim populated districts by knowing nothing like anything even like family members n siblings n most of the Muslims communities forgot everything but we are real Muslims never ever forget them and we paid for that. This guy appears to be a reincarnation. Where was he all these days? No, Rip Van Winkle has woken up and is demanding justice for his kallathoni brethren. Mr Rosaiah, were you sleeping all this time or what were you doing? Was it so cosy under the bed sheets with that pretty Tamil nadu damsel that you had no time to think and be concerned about your kallathoni brethren. Don’t worry Mr Rosiah, we are now in Yahapalana Yugaya and we will treat the kallathonis as similar to the Sinhala Buddhists of Sri Lanka. Go back to where you were, look for that pretty Tamil nadu damsel to warm your bed. Guard your words brother. For that matter all inhabitants of Lanka are kallthonies for having decended from India at one stage or the other. Read ancient history on mobilisation of humanity during the ancient past. Sad to hear our Health Minister announcing a ban on organ donors to foreigners. “Gony Billa” Rosiah needs a brain because he was born without one. SL should offer him a brain transplant from a monkey in the Wilpattu National Park. Mr. Uduruwana! So all decended from India by kallathoni, does it apply to Buddhism, as mahinda and one of Buddhist monk from India brought those teachings when in king vijayas period. Lol.? Please Eng. Maheswaram, leave Wilpattu NP alone we need at least monkeys there to the ongoing destruction of biodiversity there. Why not transplant a ‘brain’ of a SL politician?